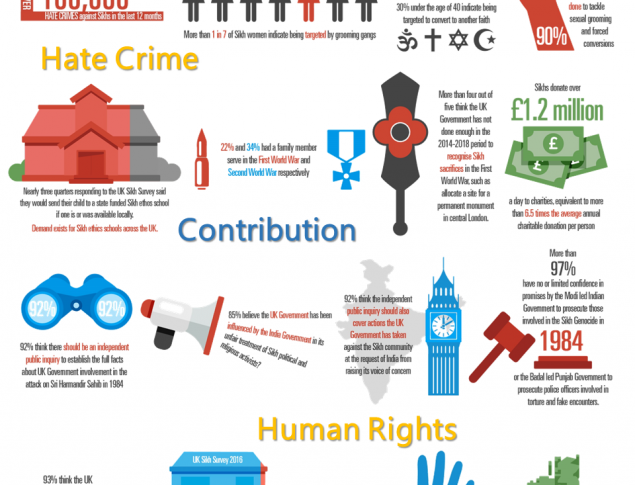 The UK Sikh Survey 2016 was developed by the Sikh Network and is the largest and most comprehensive ever survey of UK Sikhs. 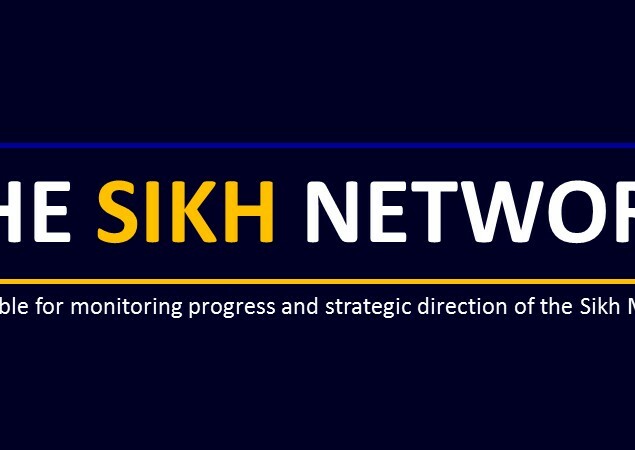 Data and information gathered in the survey will be used to better inform policy and decision making by government departments, other public bodies and political parties to properly address the needs and issues that matter to the British Sikh community. 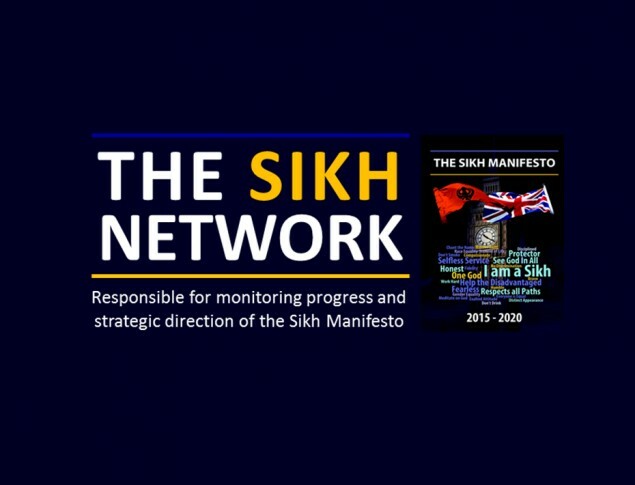 The Sikh Network is responsible for co-ordinating dialogue with the UK Government on behalf of British Sikhs with respect to the Sikh Manifesto 2015-2020. The Sikh Manifesto is an invaluable document to empower the UK Sikh community to engage with UK politicians and political parties and create partnerships with democratic institutions. The event ended fittingly with a recognition award ceremony, with special contribution awards for Balwinder Kaur Saund, Chair of Sikh Women’s Alliance, Jameen Kaur of Amnesty International for work on Human Rights, Jasveer Singh of Sikh Press Association & Manpreet Singh (Badhni Kalan) the UK reporter of Ajit Newspaper for Media services, Charanjit Singh (popularly known as Chaz Singh) for his Political contribution and Sukhbir Kaur (popularly known as Sukhi Kaur). for tireless Seva behind the scenes. A lifetime achievement award was given to S. Gurmukh Singh. All award winners were. Visibly moved at being recognised at the first Guru Nanak Dev Ji’s Gurpurb event in the UK Parliament. The exhibition is free and open to all. It will be taking place from Saturday 16th January 2016 (1pm until 8pm) Sunday 17th January 2016 (11am until 8pm) at Guru Nanak Gurdwara, High St, Smethwick B66 3AP. 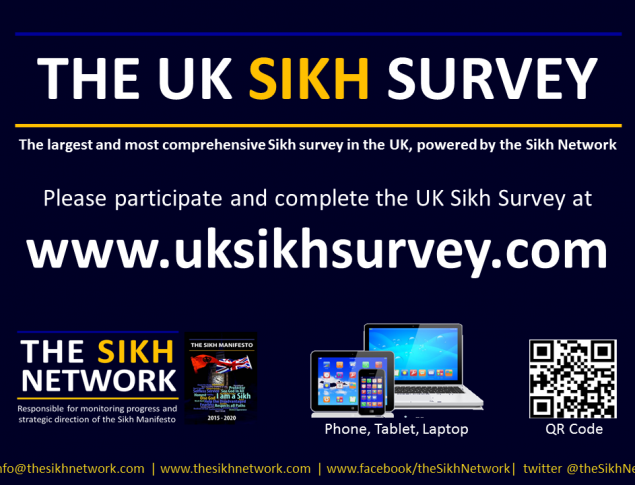 The Sikh Network are delighted to launch the largest and most comprehensive survey of the UK Sikh community. The UK Sikh Survey will map out a much needed analysis of the views, as well as challenges, faced by the Sikh Community in contemporary British Society. The Survey will be based on extensive outreach to gather the opinions of Sikhs across the length and breadth of the United Kingdom and will generate new empirical knowledge to current debates on what it means to be a British Sikh. Specifically, this knowledge will provide the British Sikh community with the tools to effectively communicate its values and aspirations with government and public institutions. This is only made possible because of the survey’s aim to conduct the largest poll of the Sikh community in the UK. The Survey is completely mobile and tablet friendly and entries are not restricted per device, so please use your phone or computer to complete the Survey for all friends and family over the age of 16, especially those who are not technology savvy. PLEASE CLICK ON THE LINK BELOW TO COMPLETE THE SURVEY (max 6 mins) AND PLEASE SHARE AS WIDELY AS POSSIBLE. Sikh groups are looking to shape the 2015 General Election result by targeting 50 key seats as part of a major campaign in support of a ten point manifesto. The target seats are mainly marginals (please see Notes section below) in which significant proportions of the voting population are Sikh. Candidates in each of the constituencies are being asked to set out their position, and those of their party, on the manifesto issues. 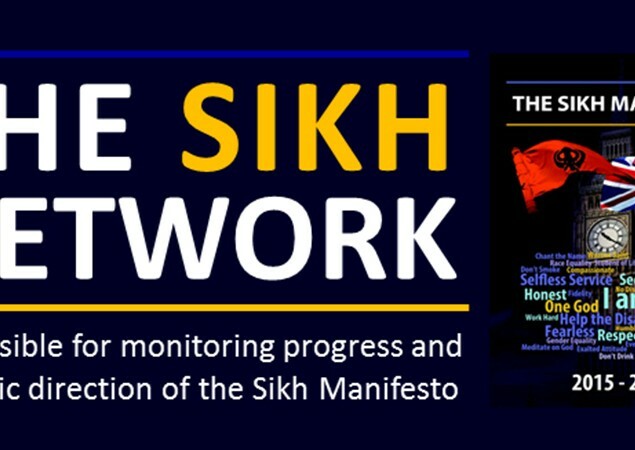 The campaign and manifesto are being launched today (Saturday 31 January) in London by the Sikh Network and supported by the Sikh Federation (UK). “The manifesto topics are of such importance to the British Sikh community that the response of parties and candidates to them will determine how many in the community vote,” said Bhai Amrik Singh, Sikh Federation (UK) chair. This manifesto publication follows a major campaign to engage the Sikh community in its development. 10,000 delegates attended the September 2014 National Sikh Convention in Wolverhampton over three days, where the issues were debated and the manifesto content developed. Tens of thousands of Sikhs marched in London in June 2014 to commemorate the 1984 Amritsar massacre and support calls, repeated in the manifesto, for an independent enquiry into UK Government involvement. “For the purposes of supporting the Sikh Manifesto we have drawn a line at the 50 target seats,” added Bhai Amrik Singh. Representatives from all 250 UK Gurdwaras (temples) and UK Sikh organisations are expected to attend the manifesto launch. Party leaders, MPs and candidates from the 50 seats have also been informed of the launch. Those at the launch will hear from speakers from each of the main parties. Party leaders have responded with messages of support for the manifesto. A message of support from the Prime Minister, David Cameron is expected on the eve of the launch. The British Sikh community will be launching the Sikh Manifesto 2015-2020 at Sri Guru Singh Sabha, Havelock Road, Southall, the largest Gurdwara (temple) in the UK, between 11.30am and 1.30pm on Saturday 31 January. This will be followed by an event at Guru Nanak Gurdwara, High Street, Smethwick, the second oldest Gurdwara in the UK, on Saturday 14 February between 1-3pm and concluding with an event in the Attlee Suite in Portcullis House on Thursday 26 February between 3-5pm. In Wolverhampton South West, for example, Paul Uppal has a majority of 691 and there are around 6,000 Sikh voters. The Sikh Network held the first Women in politics event Saturday 3rd October at Sandwell Council Chambers. The attendance at the event which was fully booked, indicated a need to engage more women and especially those from underrepresented groups to have an opportunity to participate in politics at a locally and national level. 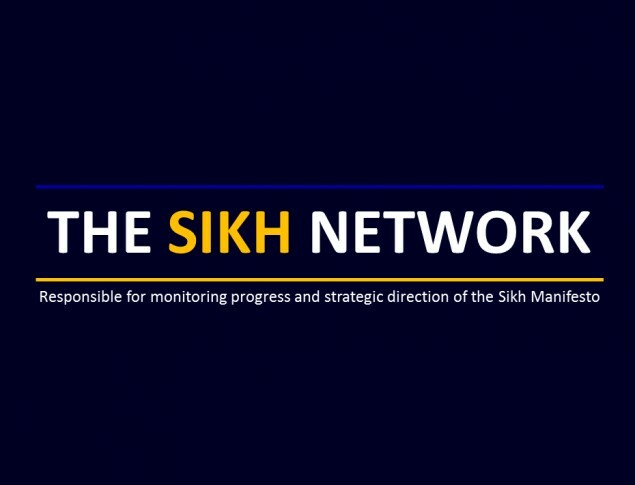 The Sikh Manifesto produced by the Sikh Network earlier this year addressed the need for effective representation in Parliament for Sikhs. The objective of this event was to take this section forward an d to inspire women to engage with politics by becoming members, campaigning, and pursuing careers as Cllrs, future MPs and MEP’s by providing insight to the political issues, processes and life from the perspective of successful women at all levels. The panel of women speakers represented all levels of the political system, including a local councillor, a Member of Parliament, a Member of the European Parliament and a Member of the House of Lords, all with cross party representation. They each shared their personal journeys, barriers, support and inspirations with the audience, urging and encouraging greater engagement from women. Kate Willoughby from Emily matters inspired and captured the audiences as she read a speech of suffragette Emily Davison, while Jess Philips, the Labour MP for Birmingham Yardley, talked about ‘women standing up for women’s issues’ and having the strength to stand up and be counted. Also in attendance was Suria Photay – the Conservative candidate in Wolverhampton South East in the last election, Baroness Lorely Burt – former Liberal Democrat MP from Solihull and Nina Gill one of the Labour MEPs from the West Midlands. The event was hosted by Cllr Preet Kaur Gill who is a Labour Cllr in Sandwell and a member of the core group of the Sikh Network. The event also included interactive workshops where delegates were split into working groups and each give a relevant key political topic to discuss and present a fresh party perspective to the group. “All those that attended were very impressed and positive about the event but stressed a demand for more of these events as women are not pushed or encouraged enough to have a career in politics. Given the instrumental and equal role Sikh Women have played throughout our history, we have a greater duty and obligation to break away from these stereotypes and stand up for issues that matter to us all”.